My feeling is that socially active art may be both in-your-face and more subtly influencing; it may mix up meanings in brutal ways, mashing them up, exploring impossible worlds and shaking us up from unheard-of angles. Public debate about the purpose of art, or more bluntly about the utility or necessity of art often turns to debate about art, and funding and the social parameters of an artist’s work. In this debate, questions of what kind of art should be funded – and how – often interconnect with questions concerning the justification of art in general. It is true, as sociologist Olli Jakonen states, writing in Suomen Taidepoliittinen Käsikirja (Finnish arts policy manual 2015), that today’s independent art world swearing by art for art’s sake was only historically enabled by the emergence of an arts market. Beginning in the 18th century, artists dissociated themselves from the patronage of courts, the nobility, academic institutions and the Church and entered the free market. Then, as now, creating art required financial resources and decisions to be made concerning those resources, and there is thus no ignoring economic discourse in this context. But it is a different matter altogether what issues are addressed in the economic discourse; more specifically, how the relationships between the meaning of art and financial policy are defined. In Finland’s current public debate on arts policy and financial policy, perhaps the loudest and most conspicuous strands have to do with the well-being impacts of art. The Government Programme of the Government of Prime Minister Juha Sipilä, published last summer, makes mention in the section “Knowledge and education” (under which art is covered in a short paragraph) of “access to art and culture” and “welfare impacts of the arts”. Nothing is said about the intrinsic value of art, only its instrumental value: how art can serve as a medicine to produce health and a sort of generic endurance that promotes the growth of the national economy. This is goal rationality of the heaviest calibre, linking the value of art directly to putative social and societal benefits that might be of some generally accepted utility, i.e. value for money. The creative economy concept, for all that it appears to acknowledge the value of art in its own right, is also above all a product of the logic of reification. However, the utility ideology of strict performance management need not be the only possible frame of reference for the funding and meaning of art. In fact, it is in many ways a highly problematic notion to apply to the arts world. In my view, its greatest problem is that it forces the potential and requirements for creating art into a restrictive mould, and this has a direct impact on the content of art. Art should never be set goals, not to speak of half-baked quality criteria, and decision-makers should steer clear of attempting to control the content of art. The relationship between forms of funding on the one hand and the objectives of art and its assumed returns or impacts on the other is always important for the content of art. Funding providers have differing social policy ideologies and aims, and it is therefore not irrelevant whether arts funding comes from public finances, community funding, self-financing, entrepreneurship or private donors. If and when the current situation leads to steering the content of government-funded art towards fulfilling aims of well-being and ideology, it is likely that creating socially critical art in particular will become more difficult. Obviously the people who come up with objectives and goals have little desire to have their handiwork or the entire system responsible for it called into question. For my part, I consider that, in an environment where there is an aggressive drive towards governing the content and purpose of art on the part of the government, we should create as much critical and socially conscious art as possible. The field of art should be deliberately diversified to embrace activities that are not as yet identified or acknowledged as art. This is particularly important in today’s entertainment-driven and uncritical media content production. Social art is usually divided into at least two strands: art that aims to influence society directly, and art that comments on the current state of society. This distinction is nominal at best, because commenting creates situations and is thus an influence of a kind. Sometimes artists are asked why they keep to art if they want to change things in society. Why not get involved in civic activism or engage in some other field? A detail of Taina Riikonen’s installation at Galleria Akusmata, Helsinki. The purpose of this work was above all to explore political rhetoric, particularly its sensory and informational aspects. Sipilä’s statement takes for granted the romanticised image of communing with nature, where the human individual encounters “nature”, whatever that is, as a separate being, humbly admiring it from afar. This little-person model emphasises how powerless any individual is in the face of the natural environment, and this completely ignores issues such as the ethical responsibility of groups of people, e.g. corporate executives, and sidesteps the instrumental and at times destructive aspects of our relationship with nature. I wanted to explore the uncomfortable feeling that Sipilä’s statement prompted in me and, as far as I can tell, in many other people: presenting assumptions as self-evident truths, unquestioningly propounding power structures and engaging in a monotonous rhetoric of no options. I ended up commenting on the statement by editing, repeating and looping it in full sentences, individual words and syllables. The resulting repetitive, grinding speech is a material manifestation of the unquestioned underlying assumptions present in the original statement as implicit threads. 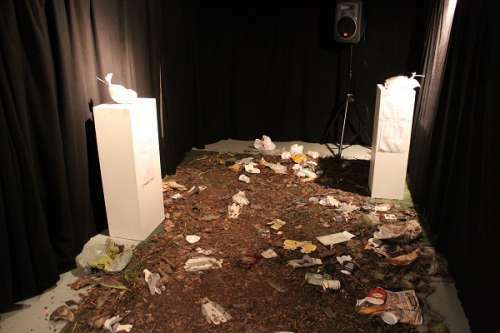 I juxtaposed this sound material with rubbish found in the street and contaminated soil samples from the Talvivaara mine. I wanted to bring together the poisoned, gooey soil, the rubbish and the insistent jabbering in such a way as to make visitors almost physically sick. My feeling is that socially active art may be both in-your-face and more subtly influencing; it may mix up meanings in brutal ways, mashing them up, exploring impossible worlds and shaking us up from unheard-of angles. Creating and crossing interfaces between different realities and playing with them is perhaps the most important thing that separates (at least in part) activism and art. And this, in my view, is the sort of art that specifically should be funded out of public finances.